A story run by the Socio-Economic Newspaper of Laos said that 80 percent of electricity produced by the plants, or 1,570MW, will be exported to Thailand, and the rest of about 384.94MW is for domestic consumption. The Lao Government and Ministry of Energy and Mines will continue monitoring and examining technical standards of all hydropower plants under construction across the country. So far, 20 dams have been inspected, while the rest 50 will be checked until 2021. Addressing the recent sixth session of the 13th National Assembly of Laos, Minister of Energy and Mines Khammani Inthilath said that Laos currently has 61 power production facilities with a total output of 7,200 MW, including 53 hydropower plants, one thermal power plant, two alternative power stations and five solar power plants. The minister said that in 2019, the country will focus on adjusting the power and mine development plan to suit its real situation and export requirements, while reviewing the implementation of all projects with special attention on safety of all dams. 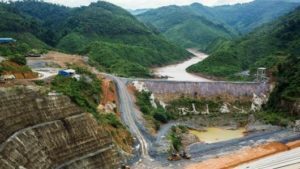 According to the minister, Laos has set up a centre for dam safety management and launched a plan to develop power transmission lines, with three electricity transmission projects expected to finish in 2019, along with three transformer stations. In 2019, the Southeast Asian country aims to produce about 33.874 billion kWh of power worth nearly 2 billion USD, of which about 25,625 million kWh will be sold abroad.